The Vatican's lawyer says then-Cardinal Joseph Ratzinger told a California bishop to make sure a priest with a history of sexually molesting children didn't abuse while the church worked to defrock him. Attorney Jeffrey Lena was responding to a 1985 letter obtained by The Associated Press on Friday in which the future pope said more time was needed to study the case of the Rev. Stephen Kiesle. Lena says Ratzinger urged the bishop to give Kiesle "as much paternal care as possible." Lena says that was a way of saying the bishop was responsible for ensuring Kiesle didn't reoffend. Lena says there were no known cases of abuse by Kiesle between 1981, when his diocese first recommended he be laicized, and 1987 when he was removed from the priesthood. The future Pope Benedict XVI resisted pleas to defrock Kiesle, citing concerns including "the good of the universal church," according to the 1985 letter bearing his signature. These new revelations draw Benedict closer to what many believe is a several-decade effort by the church to cover up sexual abuse by its priests. The Vatican insists the pope is simply a victim of a smear campaign, CBS News Correspondent Ben Tracy reports from Los Angeles. While many are demanding the pope reveal what he knew and when, the Vatican announced Friday that the pontiff is now willing to hold new meetings with abuse victims "to help them seek peace," Tracy reports. Attorney Irwin Zalkin represents a woman who says Kiesle assaulted her three times by the time she was 7 years old. Court documents accuse Kiesle of providing her with wine, binding her hands and sexually abusing her, Tracy reports. "It's time to get it out, let the world see what happened," Zalkin said. "Let's close the book on this and move on." Michael Winters of the National Catholic Reporter says the recent scandals don't just affect church leaders, Tracy reports. "Unfortunately, the Vatican doesn't appear to realize how damaging this is in terms of public relations and, you know, not just in terms of public relations but how it's so disheartening to loyal Catholics," Winters said. 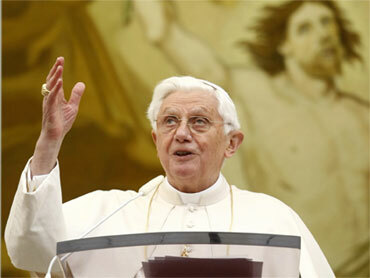 Earlier Friday, the Vatican confirmed that it was Ratzinger's signature on the letter. "The press office doesn't believe it is necessary to respond to every single document taken out of context regarding particular legal situations," the Rev. Federico Lombardi said. Another spokesman, the Rev. Ciro Benedettini, said the letter showed no attempt at a cover-up. "The then-Cardinal Ratzinger didn't cover up the case, but as the letter clearly shows, made clear the need to study the case with more attention, taking into account the good of all involved." The diocese recommended removing Kiesle from the priesthood in 1981, the year Ratzinger was appointed to head the Vatican office that shared responsibility for disciplining abusive priests. California church officials wrote to Ratzinger at least three times to check on the status of Kiesle's case and Cummins discussed the case with officials during a Vatican visit, according to correspondence. At one point, a Vatican official wrote to say the file may have been lost and suggested resubmitting materials. Kiesle was ultimately stripped of his priestly powers on Feb. 13, 1987, though the documents do not indicate how or why. They also don't say what role - if any - Ratzinger had in the decision. Kiesle, who married after leaving the priesthood, was arrested and charged in 2002 with 13 counts of child molestation from the 1970s. All but two were thrown out after the U.S. Supreme Court struck down as unconstitutional a California law extending the statute of limitations. Cummins, 82 and now retired, initially told the AP he did not recall writing to Ratzinger about Kiesle, but he remembered when shown the letter with his signature on Friday. He said things had changed over the past quarter century. "When he (Ratzinger) took over I think he was following what was the practice of the time, that Pope John Paul was slowing these things down. You didn't just walk out of the priesthood then," Cummins said. "These things were slow and their idea of thoroughness was a little more than ours. We were in a situation that was hands-on, with personal reaction."